The average cost of memory care in Linn County is $3,922 per month. This is lower than the national median of $4,650. To help you with your search, browse the 7 reviews below for memory care facilities in Linn County. On average, consumers rate memory care in Linn County 4.4 out of 5 stars. Better rated regions include Marion County with an average rating of 4.5 out of 5 stars. Linn County, located in the Willamette Valley of Oregon, is home to more than 116,000 residents, more than 15 percent of whom are seniors aged 65 and older. Some of those seniors may be part of the 65,000 Oregon residents living with Alzheimer’s disease or other forms of dementia. That number is expected to grow by over 29 percent within the next six years. There are currently four memory care facilities in Linn County, with three in Albany and one located in Lebanon. Memory Care Communities, as memory care facilities are called in Linn County and the rest of Oregon, are regulated by the Oregon Department of Human Services. The cost of living in Linn County is 102.3, slightly higher than the national average of 100. Housing is the biggest factor in the higher cost of living. Seniors might find that the lower healthcare and transportation costs at 83 and 87, respectively, help offset the higher cost of living. Linn County’s violent crime rate is 46.3, 15 points higher than the national average of 31.1, and the county’s property crime rate is 46.2, eight points higher than the national average of 38.1. Although these crime rates are slightly higher than the averages, most secure facilities have safeguards in place, like alarms and cameras. Oregon’s moderately tax-friendly status may result in Linn County seniors having more money to contribute to their memory care budget. While retirement savings income is fully taxed, and pensions are partially taxed, no taxes are applied to Social Security benefits. Linn County residents enjoy comfortable temperatures ranging from 82 to 34 degrees. Although the area gets more rain that most of the country, 56 inches compared to the average of 39, it also gets less snow than other areas of the country, four inches compared to 26. Seniors who do not like damp weather may not enjoy living in Linn County. Memory Care costs in Linn County start around $3,922 per month on average, while the nationwide average cost of memory care is $4,799 per month. To see a list of free memory care resources in Linn County, please visit our Assisted Living in Oregon page. 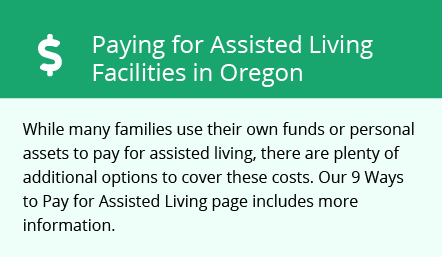 Linn County-area assisted living communities must adhere to the comprehensive set of state laws and regulations that all assisted living communities in Oregon are required to follow. Visit our Memory Care in Oregon page for more information about these laws.